Hear the world through different eyes. 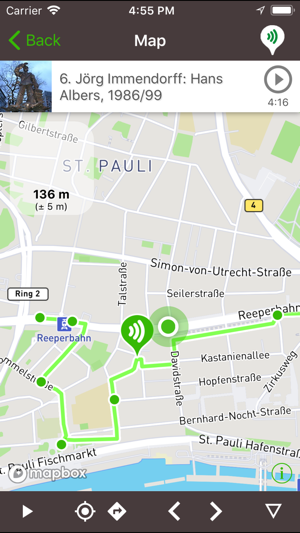 Let the Guidemate App take you on a tour through Hamburg, Berlin, and other cities. The App is your travel guide and leads you to interesting places close to you - anytime and at your own speed. Listen to facts & anecdotes or browse through the pictures & descriptions of tours and places. Discover a city with a tour by geophon. 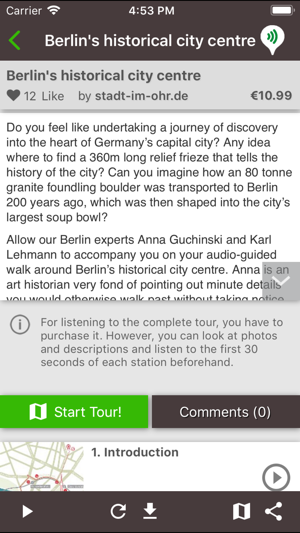 There are many English tours for German cities by Audio City. Enjoy a guided café or bar crawl. There is a growing number of English tours for some major cities in Germany and Europe and there are some Tours in Russian for Prague, Barcelona and Madrid. At this time, the majority of tours is available in German only, however. If you are a fan of travel podcasts, you'll love Guidemate's audio guides. So far, there exist tours in Hamburg, Berlin, Hannover, Cologne, Potsdam, Barcelona, Wittenberg, Cottbus, Munich, Frankfurt, Heidelberg, Leipzig, Dresden, Stuttgart, Kassel, Bonn, Hildesheim, Münster, Troisdorf, Bottrop, Wennigsen, Sellin (Rügen), London, Paris, New York, Venice, Florence, Rome, Barcelona, Valencia, Madrid, Oviédo, Mallorca, Palma de Mallorca, Shanghai, Xiamen, Peking, Hongkong, Chengdu, Prag and some more. 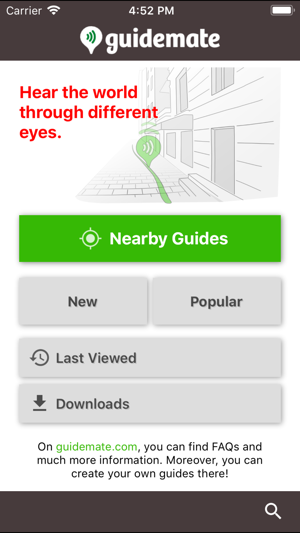 Guidemate is an audio guide plattform and is open for everyone. Create and publish your own guides easily!